Weather kind of stinks in New England this weekend, huh? How about a free NHPF T-shirt to remind of you of warmer days in June? 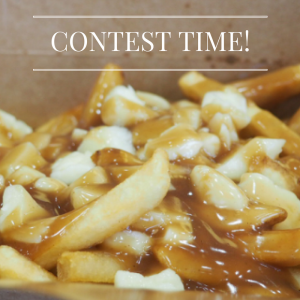 Tell us in 250 words of less about where you tried poutine for the first time and what you thought of it. We will pick a winner at random on Tuesday night and send him or her some t-shirts options to choose from! Get us your story by 5 PM on Tuesday May 9th. Looking forward to the stories! ELIGIBILITY: The NHPF T Shirt Contest is open to all legal residents of United States and Canada (together, the “Eligible Jurisdictions”) who are 18 years of age and older by 5/6/2017. Employees, officers and directors of the Sponsor (NHPF) and its parent companies, subsidiaries, affiliates, partners, advertising and promotion agencies, manufacturers or distributors of Contest materials and their immediate families (parents, children, siblings, spouse) or members of the same household (whether related or not) of such employees/officers/directors are not eligible to enter. Offer void outside the Eligible Jurisdictions and wherever prohibited, taxed or restricted by law. All federal, state, provincial and local laws and regulations apply. Each entrant in the Contest must be the rightful owner or have authorized use of the email account indicated by the entrant’s Facebook page. In the event of a dispute concerning the identity of entrant, entry will be declared made by the authorized account holder of Facebook account submitted at time of entry. “Authorized Account Holder” is defined as the natural person who is established the Facebook. Any potential winner may be requested to provide Sponsor with proof that such winner is the authorized account holder of the Facebook account associated with the winning entry. ENTRY PERIOD: Contest begins at 3 PM ET on May 6, 2017 and ends at 5 PM ET on May 9, 2017. SELECTION AND NOTIFICATION OF WINNERS: The potential winner will be selected by a random drawing from all the eligible entries received by 5 PM Tuesday (May 9, 2017.) Odds of winning depend on the number of eligible entrants. By entering the Contest, each entrant fully and unconditionally agrees to be bound by these rules and the decisions of Sponsor which will be final and binding in all matters relating to the Contest. Potential winners will be notified via Facebook on the Wednesday following the Contest. If winner does not respond to our Facebook message within 5 business days or if prize or prize notification is returned as undeliverable, if potential winner rejects his/her prize or in the event of noncompliance with these Contest rules and requirements, such prize will be forfeited and an alternate winner will be selected from all remaining eligible entries. Upon prize forfeiture, no compensation will be given. If due to a printing, production or other error, more prizes are claimed than are intended to be awarded, the intended prize will be awarded in a random drawing from among all verified and validated prize claims received. In no event will more than the stated number of prizes be awarded. One winner will receive an NHPF Logo T-shirt. This prize is provided to you by the Sponsor. Each entrant shall release, discharge, and hold harmless Sponsor and its parents, affiliates, subsidiaries, successors, assigns, attorneys, representatives and agents, including advertising, promotion and fulfillment agencies, employees, officers and directors (collectively, the “NHPF T Shirt Entities”) from any and all liabilities, loss, harm, injury, cost, expense, and damages arising from the administration of the Contest, entrant’s participation in the Contest (including without limitation travel to any Contest-related activity) and/or the use or misuse of any prize received in this Contest, including, without limitation, the following: (i) late, lost, incomplete, delayed, misdirected, technically corrupted or unintelligible entries, (ii) any printing, typographical, administrative or technological errors in any materials associated with the Contest, (iii) any damage to the entrant’s computer, related equipment, data files, or software resulting from the entrant’s downloading of information regarding the Contest or participation in the Contest, (iv) any problems or technical malfunction of any telephone network or lines, computer online systems, servers, or providers, computer equipment, software, failure of any e-mail or other electronic communication or entry to be received by Sponsor on account of technical problems or traffic congestion on the Internet or at any web site, any combination thereof, or otherwise, including any injury or damage to entrant’s or any other person’s computer, website, blog site, or other Internet or computer site related to or resulting from participation or downloading any materials in connection with the Contest; (v) unauthorized human intervention, traffic congestion, incomplete or inaccurate capture of entry information (regardless of cause) or failed, incomplete, garbled, jumbled or delayed computer transmissions which may limit one’s ability to enter the Contest; (vi) property damage, personal injury and/or death; and (vii) any claims based on publicity rights, defamation or invasion of privacy and merchandise delivery. IN NO EVENT WILL THE NHPF T SHIRT CONTEST ENTITIES BE RESPONSIBLE OR LIABLE FOR ANY DAMAGES OR LOSSES OF ANY KIND, INCLUDING DIRECT, INDIRECT, INCIDENTAL, CONSEQUENTIAL OR PUNITIVE DAMAGES ARISING OUT OF YOUR ACCESS TO AND USE OF SPONSOR’S WEBSITE AND/OR THE CONTEST, DOWNLOADING FROM AND/OR PRINTING MATERIAL DOWNLOADED FROM ANY WEBSITES ASSOCIATED WITH THE CONTEST. WITHOUT LIMITING THE FOREGOING, THIS CONTEST AND ALL PRIZES ARE PROVIDED “AS IS” WITHOUT WARRANTY OF ANY KIND, EITHER EXPRESS OR IMPLIED, INCLUDING BUT NOT LIMITED TO, THE IMPLIED WARRANTIES OF MERCHANTABILITY, FITNESS FOR A PARTICULAR PURPOSE OR NON-INFRINGEMENT. Any dispute arising from the Contest will be determined according to the laws of the State of New Hampshire, without reference to its conflict of laws principles, and the entrants consent to the personal jurisdiction of the State and Federal Courts located in the State New Hampshire and County of Hillsborough and agree that such courts have exclusive jurisdiction over all such disputes. Previous Post Tickets on sale tomorrow! Next Post Curious about 2017’s event?